The Buick Regal is officially back, a re-badged Opel Insignia sporting two Ecotec four-cylinder engines including a 220HP turbo version with 29 MPG fuel economy. GM's out for mid-size entry-luxe blood with design and equipment set to turn some heads. The Buick Regal has officially returned, and the specs read like a laundry list of ways GM could build a car to make people look at Buick again. As the car is based heavily on the Opel Insignia, the Regal wears almost identical styling save the grille and badge on the nose. While the looks do impress, it's what's under the skin that's really getting us interested. The base car gets the 2.4 liter four cylinder with 182 HP and a highway fuel economy of 30 MPG while the uplevel car will have the 2.0 liter direct injected turbocharged four-banger which saw previous duty in the Cobalt SS, though tuned to a less hairy 220 HP and still delivering 29 MPG highway. Both mills have a six speed automatic transmission. The turbo model gets something we need to know more about called "Interactive Drive Control System" (IDCS) which allows four different driver-selectable suspension settings. Inside the Regal borrows heavily from the LaCrosse's playbook, with sweeping lines, dramatic lighting, and rich textures. Seems to be finished with a bit more modern and clean flair then the LaCrosse's traditional luxury bent. We'll be seeing more of the car at the LA Auto Show but until then, check out the video, press release and official images. * Standard 18-inch wheels, leather and heated front seats, XM Satellite Radio, Bluetooth and OnStar. LOS ANGELES – On Thursday Buick will reveal the 2011 Regal sport sedan to customers in the L.A. area. Armed with turbocharged horsepower, a driver-selectable suspension system and a firm, European-tuned chassis, it delivers a driving experience that rivals the best import sport sedans in the segment. "The 2011 Buick Regal is like nothing you've ever experienced from this brand," said Susan Docherty, general manager of Buick GMC. 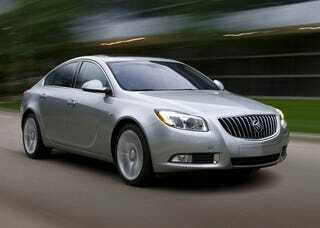 "The Regal is the next chapter in Buick's transformation and will expand the portfolio to include a sport sedan." The new Regal arrives in the second quarter of 2010, with its sights aimed squarely on competitors like the Acura TSX and Volvo S60. It has a longer wheelbase and greater trunk volume than those vehicles, along with standard features – including a six-speed automatic transmission, 18-inch wheels and OnStar – that aren't offered standard on either competitor. The Regal's development is rooted in Germany, where the globally led engineering team created the award-winning Opel Insignia – the 2009 European Car of the Year. The Insignia has garnered more than 31 prestigious awards and is the best-selling midsize sedan in Europe. Regal will bring all of Insignia's award-winning design, technology and European-inspired performance capabilities to the American market. The Regal has already been a success on another continent, in China. It went on sale in December 2008 and more than 64,000 Regals have been sold there. Enthusiastic customers cite its sculpted, flowing design and responsive performance as the top reasons for purchase. The Regal's sleek design blends the sweeping silhouette and proportions of a coupe in a progressive package that suggests motion from all angles. Great attention to detail complements that aggressive styling, with tailored applications of Buick's signature design cues, such as the waterfall grille, select use of chrome trim and superior fit and finish of the exterior panels. "Regal is all about great proportions," said John Cafaro, design director, passenger car. "For example, with the fenders flared to wrap around the tires. It's an aggressive stance that people aren't used to seeing in recent Buicks." The car's performance-oriented spirit is also conveyed in sleek, sculpted body-side detail and aggressive headlamps that further suggest motion. At the rear, an abbreviated deck and tucked-in body panels are the hallmarks of a contemporary sport sedan, with bold taillamps and their intricate lighting elements reinforcing Regal's attention to detail. Eighteen-inch wheels are standard. The sweeping design motif carries over to the interior, where the side panels flow uninterrupted into the instrument panel. The instruments have the look of expensive sport timepieces and are lit with ice-blue LED lights. The center stack, housing the climate and "infotainment" controls, was designed to allow for a lower, driver-centric instrument panel profile. Features such as a thick-rimmed, leather-wrapped steering wheel and firm, highly bolstered and leather-covered seats also support the sport-oriented driving experience. "There is great design harmony between the exterior and interior," said Cafaro. "The feeling of flow and motion carries through in an engaging manner that makes you want to take the Regal out to your favorite twisting road to see what it can do." The Regal's finely crafted, sporty and well-appointed interior builds on the exceptional attention to detail found in the Enclave and LaCrosse, blending signature styling cues with contemporary sport sedan aesthetics. Regal's firm, highly bolstered seats were benchmarked against the top import competitors for comfort and support, while a standard flow-through center console offers plenty of storage for passengers in the front and back. Smart applications of technology are also hallmarks of the Regal, including details such as a multi-function controller on the center console for operation of the audio system, navigation system and the Bluetooth phone. The faceplate for the "infotainment" screen is set at a 30-degree angle to contribute to the car's flowing interior design. Latest-generation electronic stability control (ESC or StabiliTrak), anti-lock brake system (ABS), and traction control system (TCS) are standard with Buick's innovative, Interactive Drive Control System (IDCS) real-time damping system offered on models equipped with the 2.0L turbo powertrain. Regal's Interactive Drive Control System chassis technology (available on models with the available 2.0L turbo engine) offers enhanced vehicle stability and greater driving safety. It is designed to change the personality of the car based on the personality of the driver. A sophisticated driving mode control module continually monitors driving style utilizing yaw rate, lateral and longitudinal acceleration, steering wheel, throttle and vehicle speed. It defines the dynamic vehicle state, including acceleration, braking and cornering, to optimize chassis reactions. It also executes all of the IDCS driver selections. Selecting "Sport" mode optimizes the car for dynamic driving, tightening the suspension and steering response and speeding up the reaction of the automatic transmission. The "Tour" mode is optimal for long-distance cruising or rough road conditions, providing an increase in comfort. "Normal" or Default Mode is the perfect all-around setting for daily commuting and city traffic. The other major benefit of Interactive Drive Control is that it automatically adapts Regal's performance settings to individual driving styles. When a driver begins to drive more aggressively it will tighten the suspension and increase steering effort and change to a more aggressive throttle response. When the vehicle senses that the driver is doing relaxed cruising, it adjusts settings for rolling smoothness and comfort.